Photo: Thousands of dead clams recently washed up on the shores of Chiloe Island. On April 2, 2011, National Television of Chile broadcast a documentary about the helicopter pilot and documentary maker Sergio Nuño. The documentary addressed how the Cruces River was being destroyed by toxic emissions from liquid industrial waste produced by a wood pulp mill in Valdivia owned by Celco of the Angelini Group. According to the helicopter pilot, the swans did not die because the luchecillo disappeared rather they migrated to other parts of the country in search of better food sources. For Nuño, the scientific evidence clearly indicated that the luchecillo had begun to disappear before the over-production of pulp at Celco-Valdivia and subsequent liquid waste discharge through hidden pipes in various waterways, contradicting the research revealed in this case which, naturally, did not lead to anyone being arrested. Consequently, people believed “Nuño’s Phenomenon,” a scientific theory endorsed by the phenomenal Nuño and him alone, because out of the seven scientific studies conducted to determine what caused the death of the swans and all the other degrading effects noted in the river, six of them held the company responsible for the disaster. But Nuño continued to defend his “phenomenon”: luchecillo decreased, the swan population increased and the birds migrated in search of better food, leaving behind only the weakest birds that eventually died. The company was absolved of all blame. Faced with complaints from Valdivian citizen groups, the National Television Council sanctioned the controversial TV program and Nuño was forced to take his “phenomenon” to another television channel. Celco-Valdivia was more toxic than Nuño himself had realized. However, “Nuño’s Phenomenon” took hold in other locations instead: the offices of SalmonChile, the national fisheries service (Sernapesca) and the national workers union (CUT) affiliate in Llanquihue. Thus, by replacing just one part, the new environmental disaster caused by the salmon industry in the Aysén and Los Lagos regions was attributed to “Nuño’s Phenomenon”. This global climatic event would have caused millions of microalgae to take charge of millions of salmon hatched in net pens, erected in the canals and fjords of Chilean Patagonia despite the national fisheries act. Just as TVN did when it broadcast Nuño’s programme to rescue Celco-Valdivia, the whole state system put itself at the toxic industry’s disposal to implement an official rhetoric: an incident concentrated in Reloncaví Sound, produced exclusively by “Nuño’s Phenomenon”. 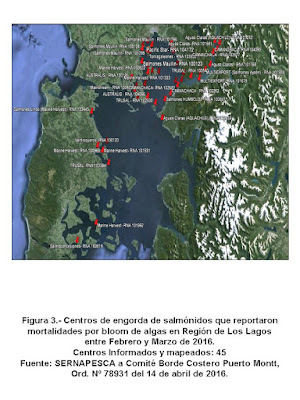 Figure 1 shows the 23 salmon farms that reported deaths from the effects of a Chattonella sp algal bloom in the Aysén and Los Lagos regions between January and February 2016. This means that “Nuño’s Phenomenon” was not an isolated incident in the Reloncaví Sound (Puerto Montt-Calbuco) but rather one that covered a 420-kilometre stretch from the RNA 103536 Tornagaleones farm in Puerto Montt bay to the RNA 110906 Salmones Antártica farm in the Aysén region. 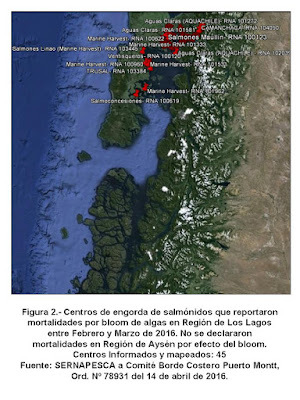 Of the 23 salmon farms affected, 12 in the Los Lagos region and four in the Reloncaví Sound experienced deaths at the same time as a CUT Llanquihue seminar which denied that the salmon industry was in crisis. Neither SalmonChile nor Sernapesca reported the matter at the seminar and it would appear that they did not pass the information to CUT Llanquihue either. Figures 2 and 3 show the salmon farms that reported deaths from algal bloom between February and March 2016. As can be seen, in Aysén no deaths attributed to “Nuño’s Phenomenon” were registered in this period. The global climatic incident made an exception for this region known for its horse-riding competitions, spit-roast lamb and being the melting-pot where the philosophers Iván Fuentes and Antonio Horvath originated from, and its effects were limited to the Los Lagos region. Nothing more was heard about any “phenomenon” in Aysén, not from El Nuño or from El Niño – an inspiration for the scientific world, a new oceanographic and climatological Big-Bang. But “Nuño’s Phenomenon” requires dubious statements. That was where Sernapesca came in, neglecting to mention in any of its statements that the algal incident had reached as far as the Aysén region. Thus, no figures were produced, neither the number of farms affected nor the number of deaths that occurred and few of the statements detailed what happened to the millions of dead salmon. Sernapesca once again turned into a labyrinth from which the truth could not find a way out. According to the national director of Sernapesca, José Miguel Burgos, the final outcome of this climatic incident was that some 40 thousand tons of salmon were destroyed between February and March 2016 in the 45 farms that were affected by algal bloom. 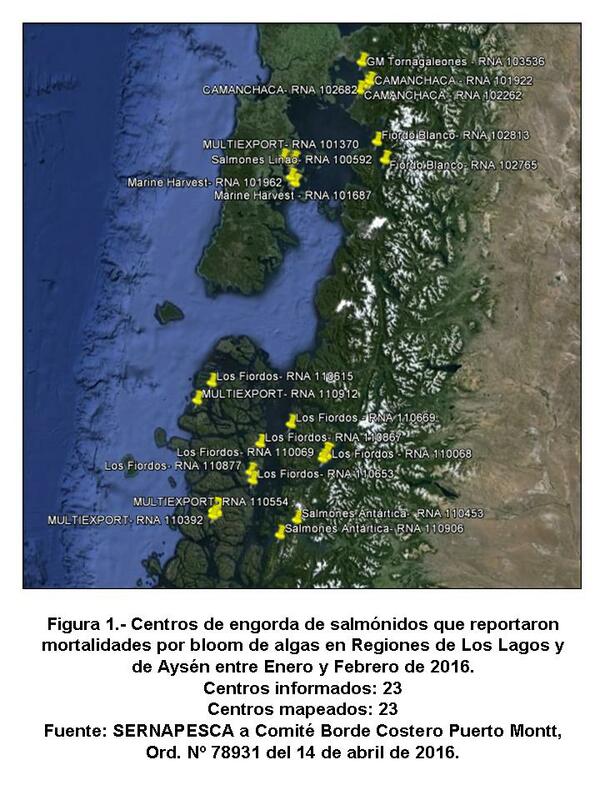 But what happened to the salmon that died between January and February 2016 in the Aysén and Los Lagos regions, which corresponded to 23 farms? How many salmon died, what weight? Most importantly, what happened to the dead fish? Where were they laid out, where were they dumped? “Nuño’s Phenomenon” had simply changed species and it continues to this day, threatening the lives of Chilean coastal communities from Quellón to the northern tip of the Los Ríos region. Chiloe’s inland sea is in a complete state of eutrophication as a result of the salmon farms. But just like in “Nuño’s Phenomenon,” nobody is to blame for anything. The regulatory and fiscal public bodies for aquaculture became “promoters” of SalmonChile. Furthermore, Sernapesca established a business platform (Siscomex) to facilitate the exportation of salmon products from Chile to the United States. This means that the fiscal body is now part of the salmon commercialization chain that is infecting our fjords and canals. For the present Chilean government of Michelle Bachelet, as with previous governments, a salmon continues to be worth more than a human life, a net pen more than a fjord, and funding for a parliamentary campaign more than an archipelago. They are prepared to destroy whatever they have to, wipe out fish from the sea and coastal communities if necessary, in order to keep the ultimate Chilote myth afloat. Public services are the greatest danger, co-opted by corrupted officials who receive and distribute false information that is prepared in such a way as to protect the interests of businesses, information provided by the spokespeople for the CUT Llanquihue simpletons and their immortal dives. We depend on them to remain informed and to take precautions in the matter, as well as with the level of destruction that could be reached in the Patagonia sea and the chances of recovery. They are the main problem to be solved and the greatest threat to stop. Abandoned by the state and left at the mercy of the salmon farms, the inhabitants of Patagonia’s coastline are having to take charge of not only the problem but also the solutions. But in order to do this, the organizations must have precise objectives and be efficient, incorruptible, based on fact and not on ancient fishing and worldview traditions that have also been sold to the highest bidder. Everything has to be different to what we have done so far, because what we did was not useful. These organizations will determine whether some day it will once again be safe to consume products from the Patagonia sea. While a toxic industry continues in the southern seas, the sea is in danger just as our lives are, unless we demand and succeed in eradicating this industry completely. Hector Kol is a Chilean marine biologist working on salmon farming issues in the country for more than two decades.